A tree is a woody perennial plant that has a single trunk arising from the ground (typically without branches near the base) and that usually grows to 20 feet (6 meters) or more in height. Branches and twigs grow from the trunk of a tree to form its characteristic leafy crown. Trees are the dominant plants in the world's forests, providing critical habitats for the other species that live there. Trees also provide many products that are important to humans, such as fruits, nuts, timber, and medicine. Trees may be classified into two major groups: deciduous and evergreen (conifer). Deciduous trees shed their broad leaves at the end of the growing season—typically each fall. Examples of deciduous trees are maples, oaks, and elms. Evergreen or coniferous trees typically have needle-shaped leaves that remain for several years before being replaced. Pines, firs, and spruces are examples of evergreens. Bark is the protective external covering of the stems (roots, trunk, and branches) of trees. The waterproof outer layer is known as cork. Composed of dead cells, cork can be as thick as several inches or more and serves to protect the internal living tissues from insects, animals, fungi, fire, and dehydration (the loss of water). Underneath the cork is a layer of living tissue called the phloem (pronounced FLOW-em). Phloem cells are elongated cells that transport plant nutrients, such as the carbohydrates made during photosynthesis, from the leaves to all other parts of the plant. When young, all trees have smooth bark. As trees mature, the outer surface of their bark begins to change in appearance, varying greatly among different species. For example, the bark of a mature American beech is distinctively grey and smooth while the bark of a mature sugar maple is rough and scaly, with deep fissures (long narrow cracks). Beneath the layers of bark is the cambium layer, a living sheath or covering of cells. On its outside face, the cambium produces phloem cells. On its inside face, it produces xylem (pronounced ZEYE-lem) cells. These thick-walled cells carry water and mineral nutrients from the roots to the farthest branches. 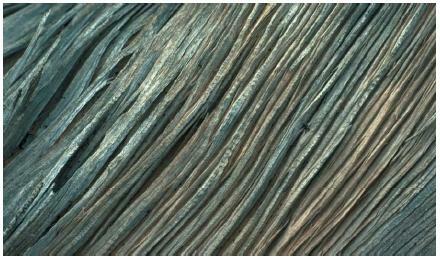 The broad layer of xylem tissue is known as the sapwood. Finally, the heartwood is in the center of the tree. As a tree ages and increases in diameter, dead xylem cells are used to store waste products, such as resin and other compounds. These waste-filled xylem cells form the heartwood. Typically darker than the sapwood, the heartwood is very stiff and serves to strengthen the tree. Bark: Protective external covering of the stems (roots, trunk, and branches) of trees and other woody plants. Cambium: Plant tissue that produces phloem and xylem cells. Cork: Waterproof outer layer of bark composed of dead cells. Growth ring: Layer of wood produced in a single growing season. Heartwood: Dead central portion of wood in a tree. Perennial: Any plant that lives, grows, flowers, and produces seeds for three or more consecutive years. Phloem: Plant tissue consisting of elongated cells that transport carbohydrates and other nutrients. Photosynthesis: Process by which light energy is captured from the Sun by pigment molecules in plants and algae and converted to food. Sapwood: Newly formed, outer layer of wood between the heartwood and bark that contains the living elements of the wood. Xylem: Plant tissue consisting of thick-walled cells that transport water and mineral nutrients. The periodic formation of layers of xylem cells results in the diameter growth of trees. New sapwood is created during each growing season, but within two to three years these cells become part of the heartwood. In most trees growing in a climate with definite seasons, the cambium produces wide, thin-walled cells in the spring, narrow thick-walled cells in the summer, and few or no cells in the autumn and winter. This seasonal cell production results in the formation of annual growth rings. The bristle-cone pine is the world's longest-lived tree species. One specimen of this species has about 5,000 growth rings, indicating it is at least 5,000 years old. Within a given growth ring, the large cells of springwood and the small cells of summerwood are often readily seen with the naked eye. Light, temperature, soil moisture, and other environmental factors affect the growth of trees, and therefore the width of their growth rings. Humans use trees as a source of food, building materials, and paper. Almond, coconut, cherry, prune, peach, pear, and many other tree species are grown in orchards for their fruits and nuts. The wood of many trees is a valuable construction material because it is relatively inexpensive, easy to cut, and very strong relative to its weight. Many species of pine and other conifers are important sources of softwoods, while deciduous trees are important sources of hardwoods. 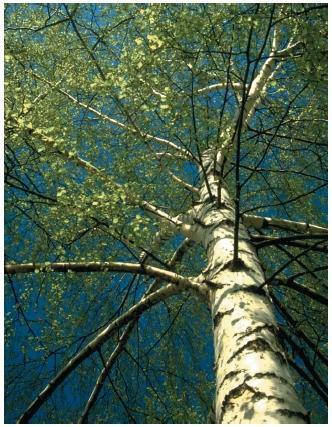 Chemicals in the bark of specific trees are used for medicinal or commercial purposes. Quinine, found in the bark of the South American cinchona tree, has been used for many years to treat malaria. More recently, anticancer chemicals have been discovered in the bark of the Pacific yew. Tannic acid, extracted from the bark of North American oak, hemlock, and chestnut trees, is used in tanning (the process of turning animal hides into leather). The bark of certain trees is itself used to create products. The light, spongy outer bark of the European cork oak is used for bottle stoppers and in life rafts, insulation, and flooring. The bark of certain conifers, such as Douglas-fir and redwood, is used as a mulch in landscaping. this is a very well made article that really helped me study for a biology test that is coming up. However i was wondering if you could add one word to your "Words to Know" list. Its called a "pith" and even though i have no idea wat that is i was hopeing that maybe u could add for later readers of this article. But other than that i really got some good info from this site. Thank u! Highly Informative without being dry. This is an area of personal study that I have found to be particularly long winded with chains of dry terms. This description is much more to my tastes. Thanks. I think this is a great website to help teens like me in school. What is the circular ring of external growth sometimes seen encompassing/ or on a tree trunk? It looks like a large tree tumor. A very good educative piece of work for biologists and even other interested researchers in related fields.